Here, we should note that BCD cannot be greater than 9. The addition of two BCD numbers can be best understood by considering the three cases that occur when two BCD digits are added. Let us consider additions of 3 and 6 in BCD. which is BCD code for 9. Add two BCD numbers using ordina7 binary addition. 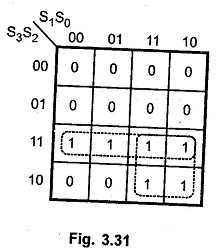 If four-bit sum is equal to or less than 9, no correction is needed. The sum is in proper BCD form. If the four-bit sum is greater than 9 or if a carry is generated from the four-bit sum, the sum is invalid. To correct the invalid sum, add 01102 to the four-bit sum. If a carry results from this addition, add it to the next higher-order BCD digit. One more 4-bit adder to add 01102 in the sum if sum is greater than 9 or carry is 1. The logic circuit to detect sum greater than 9 can be determined by simplifying the boolean expression of given truth table. With this design information we can draw the block diagram of BCD adder, as shown in the Fig. 3.32. As shown in the Fig. 3.32 , the two BCD numbers, together with input carry, are first added in the top 4-bit binary adder to produce a binary sum. When the output carry is equal to zero (i.e. when sum ≤ 9 and Cout = 0) nothing (zero) is added to the binary sum. When it is equal to one (i.e. when sum > 9 or Cout = 1), binary 0110 is added to the binary sum through the bottom 4-bit binary adder. The output carry generated from the bottom binary adder can be ignored, since it supplies information already available at the output-carry terminal.